What are the RUN scripts? 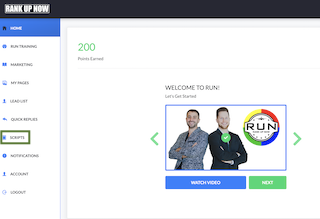 Another feature we have in RUN is a series of scripts you can use when calling on a potential customer. Click on Scripts from the navigation bar on the left side of your screen. 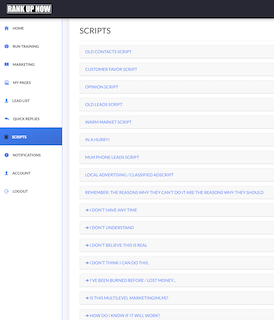 Once you click on Scripts, you'll see a collection of messages that are there for you to use when communicating with your clients, addressing any details or concerns they may have. The subjects of these scripts range from Old Contacts to I Want to Talk to My Spouse. These scripts have been written for you to turn a potential client into a paying customer with a phone call. Look through all of them to determine which one can be used with your next phone call.